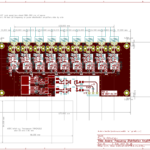 1:8 frequency distribution amplifier based on LMH6702 and LMH6609 op-amps. 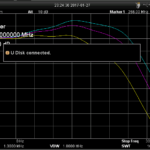 In particular the power-supply section using a common-mode choke, a Murata BNX025 filter, and low-noise regulators LT1963 and LT3015 seems to work quite well. 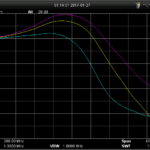 I also used ferrites (2 kOhm @ 100 MHz) as well as an RC-filter on all supply pins. Perhaps overkill? Performance with the intended AC/DC brick is still to be verified. 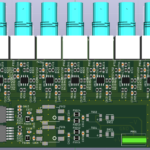 Board design with either SMA or BNC connectors spaced 16mm apart. 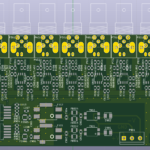 PCB in KiCad. 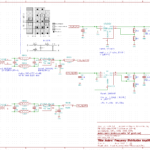 Voltage regulators get quite hot so should move away from the op-amps in the next revision. 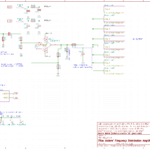 3D models (partly) in KiCad. 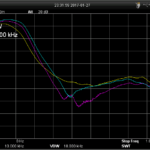 Measurements around 10 MHz show a 1 dB compression at over 14 dBm and an IP3 of around 27 to 30 dBm. 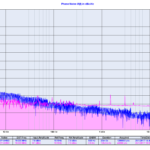 The gain extends beyond 100 MHz with some gain-peaking. 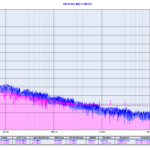 Gain and compression measurement at 10 MHz. 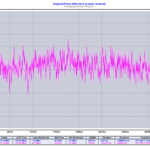 Some measurements of residual phase-noise with a 3120A phase-meter, at 10 MHz. 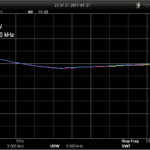 My earlier distribution amplifier required shielding with aluminium foil as well as powering from a lead-acid battery to achieve a reasonably quiet phase-noise spectrum. 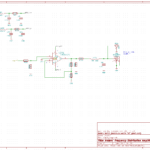 These measurements were done with lab power-supplies for +/-12 V to the board and without any shielding. AM noise. 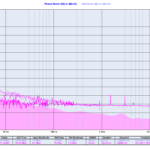 Note that noise-floor measurement run is shorter than actual amplifier measurement. 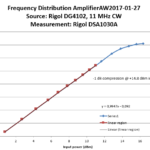 Finally some measurements of gain vs. frequency with a Rigol spectrum analyzer. 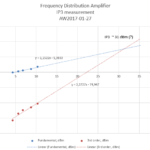 Gain flatness around 10 MHz for output channels 1, 4, and 8. Gain-peaking for original design. Channels 1, 4, and 8 left to right. 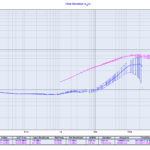 More moderate gain-peaking after adding 100pF cap to output stage. Again from left to right channels 1, 4, and 8. 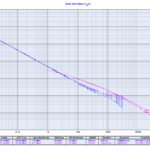 Gain up to 1 GHz. 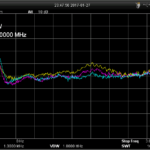 Gain to full span of SA, 3 GHz.